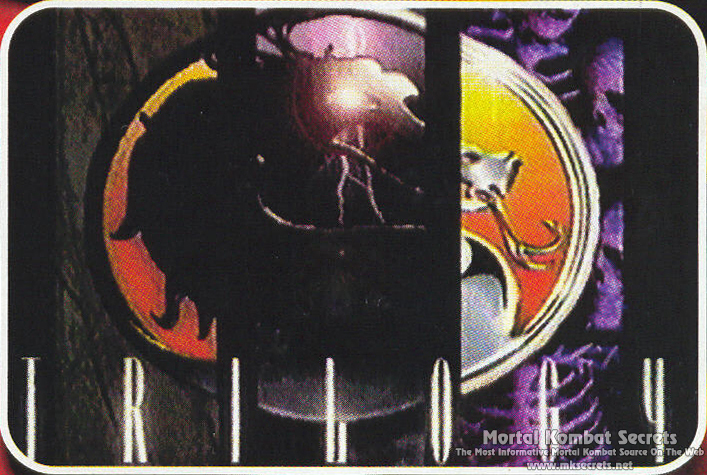 Below you can see a picture of the original Mortal Kombat Trilogy logo, that contains parts of the logos of all previous Mortal Kombat games. The second image is only a slight modification of the final version of the logo. During the development period these versions have been replaced with the one, that is in the game. 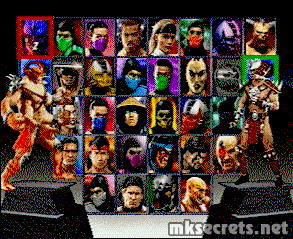 The very first select screen that was shown to the public is not the one we all know from the final game. 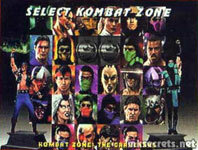 The select screen below appeared in a several magazines and in a couple of trailers that were related to the game. What is the difference? 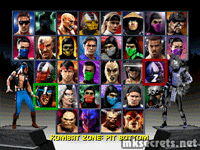 Johnny Cage is not part of the team, same with all the bosses and Human Smoke. 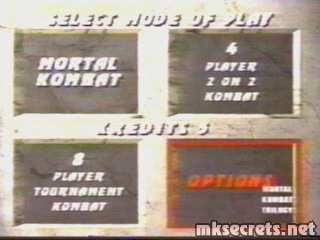 The "Select mode of Play" screen below is also a part of the same version of the game. In later beta versions of the game the "Select Your Fighter" screen changed several times depending upon the version of the game. 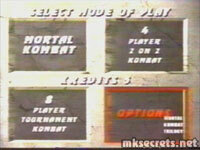 The three images below show the evolution of the select screen for the Sony PlayStation version of the game. The select screen from the first image contains no boss characters and no Johnny Cage. Instead there is one question mark field, the perpose of which is unknown and Human Smoke has been made selectable. This version is the first that features the new design that we know from the final game. The select screen from the second image already contains the four bosses (Goro and Kintaro's icons still uses the original Human Smoke icon from Ultimate Mortal Kombat 3). 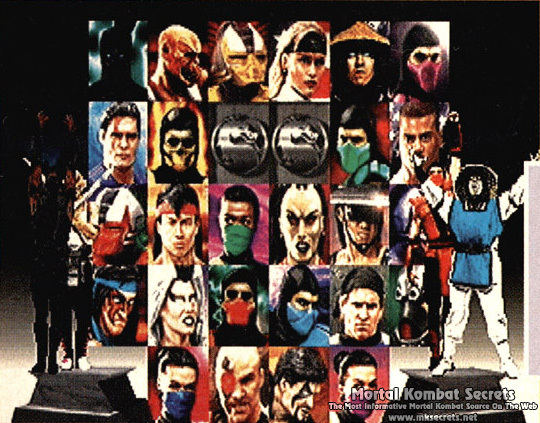 Johnny Cage is still missing, but there is a dragon logo right before Kintaro's icon. 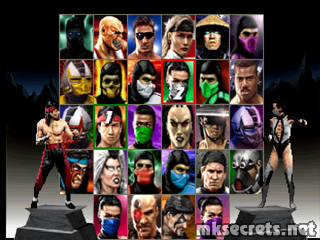 The third image shows the final version of the select screen with Johnny Cage and a significant change in the order of the icons. 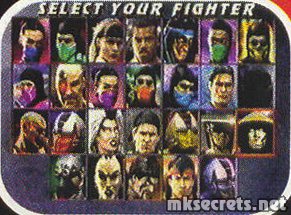 The next three images show the evolution of the select screen for the Nintendo 64 version of the game. 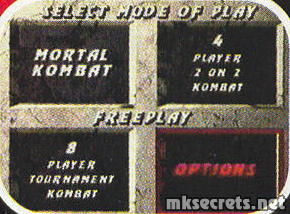 The select screen from the first and the second image features the new design. 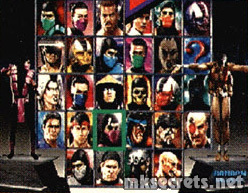 The most noticeable difference from the final select screen, shown on the third image, is the absence of Johnny Cage and the fact that the young Sub-Zero (Unmasked) is still present in the game. Looks like he was the one to be secrificed for the inclusion of Johnny Cage. 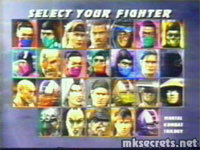 Originally Johnny Cage was the only one character who would not appear in the game. 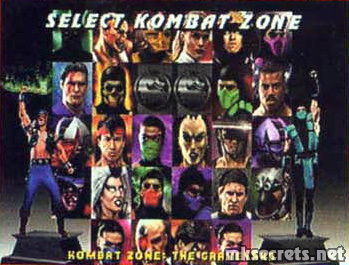 This was, because the actor, who made the motion capture for Cage in mortal Kombat II got fired by Midway, because he used his role as Johnny Cage in the game to advertise a product made by other company. 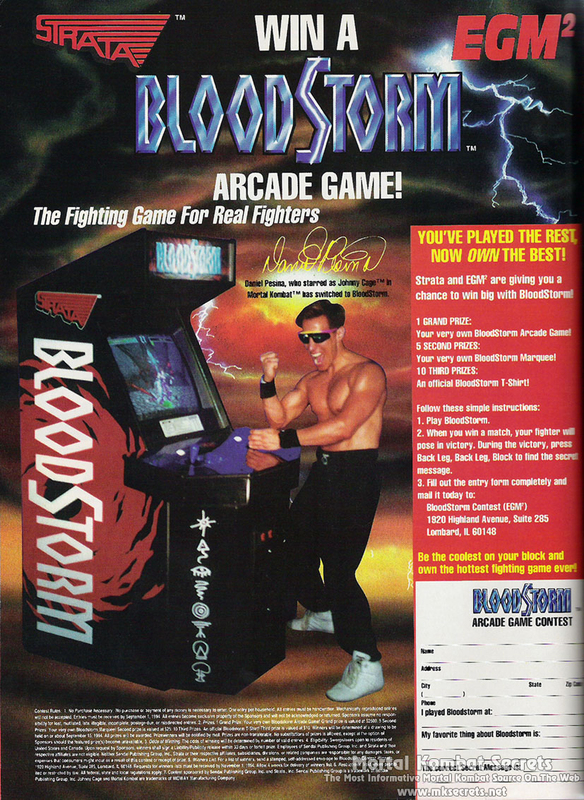 An image of this advertisement can be seen below. 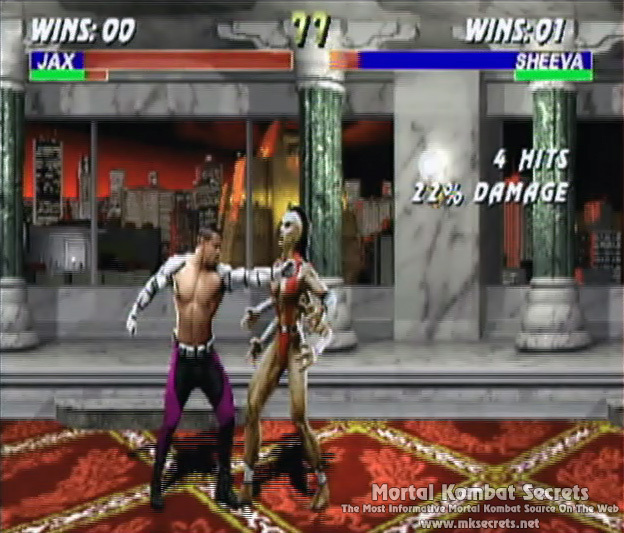 Later the team decided to make a new motion capture with a new actor (Chris Alexander) for this character, and so appeared the new Johnny Cage. 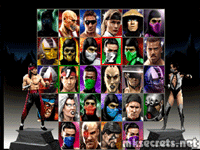 He is the only one character who uses new sprites in Mortal Kombat Trilogy. 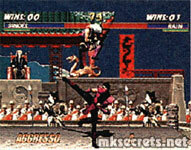 The first screenshots of this background that were released to the public still had Shang Tsung sitting on the throne, instead of Shao Kahn. 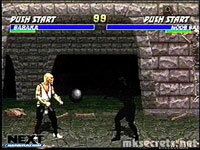 An early screenshot reveals that Noob Saibot's projectile looked very different from the one in the final version. In fact, we cannot say for sure if that really is the same special move or not. On this screenshot you can also see that the first version of Goro's Lair had no blood on the walls. 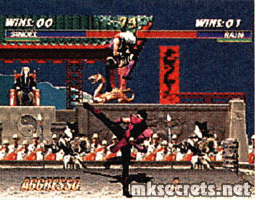 Another early screenshot reveals that Human Smoke originaly had one of Scorpion's Fatalities. 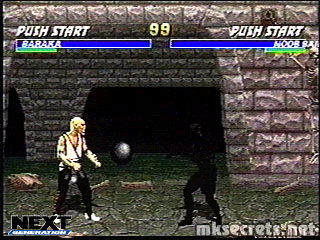 Johnny Cage was going to be a hidden character on Nintendo 64 and PlayStation and Goro was planned as hidden character on the PSX. 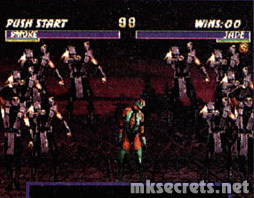 The bio given to Rain in most instruction manuals, which states that he is a Lin Kuei ninja, actually belonged to Tremor? 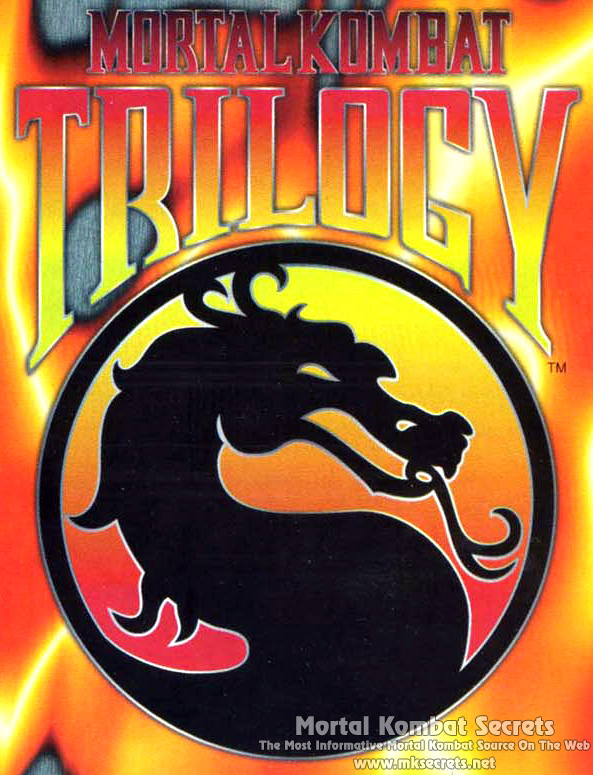 Tremor was to be put in Mortal Kombat Trilogy, but eventually pulled out. However, in early versions of the game his bio would appear as a glitch. Rain's false Bio that originally belonged to Tremor can be found below. Rain is an assassin working freelance. 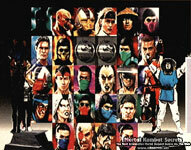 He was once a member of the Lin Kuei along with Sub-Zero, but left the clan under mysterious circumstances. Years later, Rain is found working for Shao Kahn as an assassin in the Outworld. Born a human, he finds himself questioning his loyalty towards Kahn after watching the invasion of Earth. - Things that were supposed to be in the game, but later removed. REWARD IS THE OPPORTUNITY TO WITNESS THE INNER ANIMAL ALL WARRIORS POSSESS. YOUR REWARD IS THE OPPORTUNITY TO WITNESS THE CHILD IN ALL OF US. YOUR REWARD IS THE OPPORTUNITY TO WITNESS THE KIND SPIRIT WITHIN ALL WARRIORS. JOHNNY CAGE LOSES BIG TIME ! !